As soon as we got offered jobs in Spain everyone said to us: “Are you going to rehome your pets?” The quick answer being no! We have acquired two cats and a golden retriever over four years, and would be lost without them now. A few months later we are still in the process of moving them over, but thanks to an understanding family our patience has paid off and we will be reunited with our dog (at least) by this Sunday! We’ll start with the pooch as she’s the one we’ve now sorted (provided no mishaps go down). When we found out we were moving abroad the first thing we did was contact our vet, and find out exactly what we would need. We were dreading the massive bill but it turned out to be a million times cheaper than we thought. 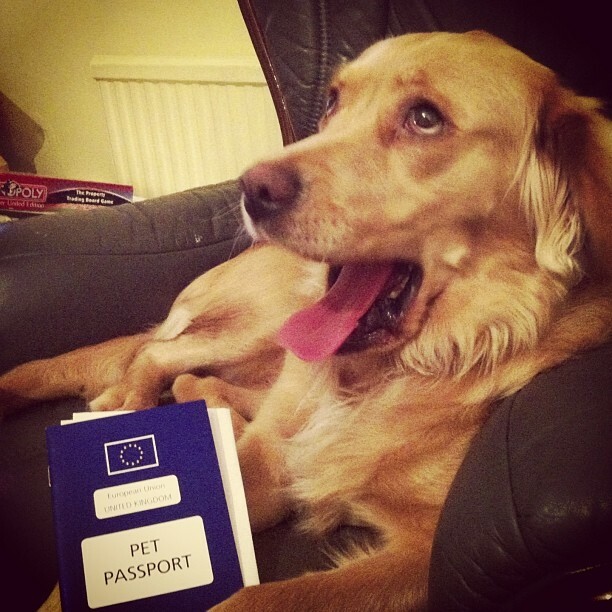 The pet passport (in line with the DEFRA scheme) actually costs nothing, it’s just the rabies shot and annual vaccine that needed doing and paying for. It simply equated to £45 for the rabies vaccine, and whatever cost to make sure she was up to date with annual boosters. The cost may differ depending on vets but ours thankfully was incredibly reasonable. Unfortunately this was the easiest bit, everything else turned out to be expensive. You probably can’t believe that it costs about £50 (on average) for a person to get to Gib/Spain, but a flight for a dog in the cabin costs £600. And that’s without the added cost of a dog crate, possible airline checks, etc. So we decided to look into the approved pet routes for ferries. It’s so much easier to bring animals that way, you pay about £60 for the kennel on the ferry, plus you get to check on them. The perk of the ferry for us was that we killed three birds with one stone; bringing the car, the dog and some of our belongings. The overall cost of the ferry trip equated to about £500 – 100 cheaper than the airline quote. The rough cost comes from £300 for person’s cabin in the ferry, £60 for the dog, petrol, etc. So way cheaper, and not to mention that this mode of transportation is way more humane for the poor little puppy. Especially if you have a dog like ours who is scared of her own shadow. Anyway we settled on Brittany Ferries, travelling from Portsmouth to Santander, followed by the drive from Santander to Southern Spain. Prior to deciding on bringing the car too, we looked into taking the dog on Spanish trains – for those of you thinking of doing that, it is possible and cheap. In fact some of the times you don’t even have to pay for the dogs ‘seat’. We’ll keep you informed of how the journey goes down… You never know, we could be eating our words!